Reviews | More Than Everything | Cardeno C.
More Than Everything is my first read by Cardeno C., but it will definitely not be my last. I loved Charlie, Scott, and Adan's story. Even though this is primarily Charlie/Chase's story to tell, getting Scott and Adan's perspectives allowed for all sides of their relationships/experience to be explored, and it also allows readers to see the growth that occurs for all three of them when they reunite many years later...More Than Everything is a story that spans over twenty years, and in that time, readers get a insiders' view of all that Charlie has experienced and endured. Cardeno C. is a fantastic storyteller because the three perspectives are seamlessly woven together to ensure readers understand how all events have shaped the characters. 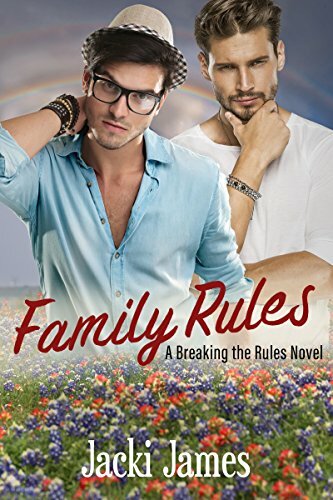 With great character development, conversational storytelling, and steamy scenes that truly illustrate the depth of feelings involved, readers are in for a great read in the Family series. I have read hundreds of m/m romances, and quite a few m/m/m both of the menage variety and triad emphasis. This book doesn't fall into either of those categories neat and tidy. It's something different, something new, really something incredibly beautiful. ... We fall in love with Charlie. He is incredibly beautiful. He is also funny, artistic, and full of life and vibrancy. Scott is the perfect first love. ... Scott is strength. ... Adan is my favorite character in this story. He is unhealthy, he is uncomfortable in his skin, and he has no idea how to have a relationship. ... Charlie isn't blind. He sees this man for who he is, but loves him anyway. ... Part three is where this story gets brilliant. Most romances are all about the HEA but they never show what that looks like. ... Here we see how a family is built. ...There is commitment and it felt like I was taken out of a romance novel and plopped right down into a real neighborhood, watching a real family take shape. A family with three men, and so much more. If you love Cardeno C, if you have never read any of CC's books I highly recommend this book. This book is a must read. It will break your stereotypes down, it will make you laugh until you cry and weep because you mourn. And then when you get to the end you get the joy of starting all over at the beginning again. In many ways this book shows a development of an already great talent. This story is smooth, the writing is clear, concise and beautiful. The shifts between times and voices was flawless and creatively done. The plot pulled me in and carried me along on a journey of first loves, loss, second chances, forgiveness, personal growth and what it means to truly love someone and want to create a life with them. I loved everything about this book. There was not one false note. Charlie "Chase" is an absolute delight. ... He's a dancer and a bit of a dreamer who has had to make his own way in the world and even though Scott and Adan each took a turn at breaking his heart, they could never break him nor forget him. Scott is great. ...He is the perfect first love and I fell in love with him right along with Charlie. ... Adan was complicated. He was so damaged by his macho culture upbringing with a huge chip on his shoulder and a drive to succeed professionally that left little room for much else in his life. I loved how he was with his men. He saw and remembered everything about them, he understood them. He, of all of them, grew the most in this story. In the most delightful and beautiful ways. ...Honestly, I was a little nervous going into this triad story. But I trust Cardeno C to get me to a happy ending. I knew CC would make me cry with this one. I cried happy because it was so beautiful and sweet, I cried sad because they were breaking each other's hearts, I laughed long and hard at some of the stories, I rejoiced and hoped and believed. I loved every moment. I want more. These men will be ones that I revisit again and again. So I think the first thing that made this book for me was Charlie's voice. The way the story is told from his point of view and the way that his attitude comes through drew me in and had me falling in love before the end of the first chapter. ... This book will take you through everything, every emotion and thought and feeling in the best possible way. If you enjoyed the first two books in the Family series then adding this book to your library is a no brainer and if you haven't read the other two then stop what you are doing and read them now. You will thank me in the end. These books reaffirm that the best family is the family that you pick yourself and that when you are offered a second chance, take it! Cardeno is one of those authors that has become and auto-buy for me in a very short period of time. Fabulous stories and unforgettable characters are in every book! A family size package of Double Stuf Oreo cookies - that's what this book reminded me of. For me, that equates to a package full of pure bliss. And, as if one helping were not enough, I had to gorge myself with a second (or in this case, an immediate re-read)! ... I dare you not to fall in love with Charlie - in fact, I'll double dare you... Those two cookie shells need the fluffy center - it's the only thing that makes them complete. And those three pieces together? A little taste of heaven on earth! ... While it may seem logical to expect sadness in a story involving splits, this is not a sad story. Yes, there is clearly some pain involved, but the story doesn't dwell in those areas. The author keeps things moving along and you can't help but look forward to the next chapter in their lives. ... So, yeah, a family size package of Double Stuf Oreo cookies - that's what this book is all about. Grab the package and be a glutton. It's more than worth it!